Clearly my goal to post more often this year has fallen by the wayside! I've been busy organising my office and spare room, as mentioned in my last post (still no new photos yet – soon!). There are two reasons for this – it was long overdue, and the spare room is being requisitioned for a new purpose – a baby's room. Yes, I'm having a baby in June, so I'm having a bit of a tidy up and destash so that I can squeeze everything from the spare room into the office. It's actually quite satisfying getting rid of things you no longer require, and since I've been downsizing lately, it's become more necessary. Over the years I've accumulated more and more things, and the last flat we lived in had a lot of space to store it. When we bought our house just over a year ago, it was slightly smaller with less storage, so things became a bit more crammed, and the sorting had to commence. Now that I have to downsize by another room, it's become more urgent! I don't like throwing things into landfill if I can help it, so the second half of the problem becomes what to do with all the things I don't need any more. Fortunately trademe is a good place to find new homes for obscure things, though I'm yet to make my fortune doing that. Charity shops are always another good option, and if you have time for a quick browse when you're dropping things off you can often find something you need to buy, and share the love even more. Once I've put up the last lot of new curtains, the old ones will be going to the Curtain bank, a charity that resizes old curtains for families in cold houses. I've also got some surplus candles which are taking up valuable space and need new homes as well. I'm trying to streamline my product offering a bit more, to make setting up at markets a bit more efficient. This means I won't be making any more of some older candles. 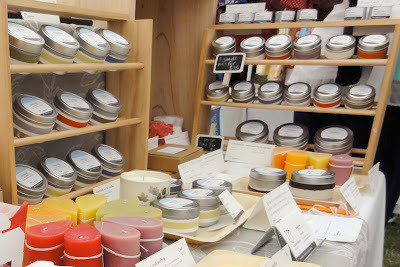 If you'd like to take a look at what's on offer, I have a section on the website for discontinued candles, which includes discontinued fragrances, the small and large tins, and ice candles. So if you are a fan of the rainforest, chocolate or coffee fragrances, then snap them up now so you don't miss out. I'm also having a sale on selected products which can be found in the sale section. There are also a few bumped and knocked candles in the seconds section. Last but not least, because it's almost the end of the financial year, and stocktaking is boring, I have another incentive for you to stock up on candles. 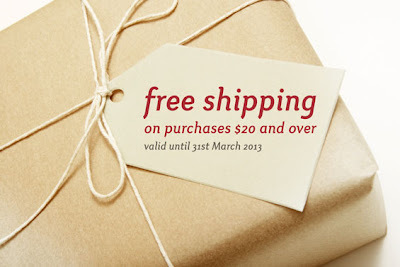 Any purchases $20 and over before the end of March receive free shipping withing New Zealand. This will be automatically applied on the website, and if buying on Felt, just enter the code FREESHIP at checkout. I'm getting to the end of the sorting now, and can nearly fit everything in the wardrobe in the office. Trust me when I say this is quite an achievement! So hopefully I'll have some new photos to put up in the next few weeks. It would be nice to make a few baby things before the baby comes as well, so once I've finished all this organising, I might even have some time for this!